CHO cells expressing mouse TLR2. Our Abpromise guarantee covers the use of ab11864 in the following tested applications. Before use in biological assays the product should be filter sterilised. Depending on the working concentration, it may need to be dialysed against tissue culture medium to remove the sodium azide added. 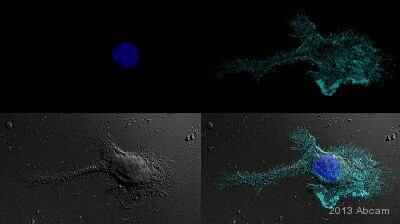 ab11864 staining TLR2 in Mouse primary macrophage by ICC/IF (Immunocytochemistry/immunofluorescence). Cells were fixed with paraformaldehyde, permeabilized with Acetone for 5 minutes at -20°C and blocked with 1% BSA for 60 minutes at 25°C. Samples were incubated with primary antibody (1/150 in PBS + 1% BSA) for 2 hours at 25°C. A Cy5®-conjugated Goat anti-rat IgG monoclonal (1/500) was used as the secondary antibody. Publishing research using ab11864? Please let us know so that we can cite the reference in this datasheet. I need an information about your product no. ab11864 (TLR2 antibody[6C2]). I will investigate bacterial proteins whether they can activate TLR2 and cytokines as end-products can be secreted using mouse macrophage cells. However, application notes on your antibody TLR2 antibody [6C2] do not describe our objectives, that is, blocking property is not included. Therefore, I want to know whether it can block mouse TLR2 for blocking experiments. Can it be used as an antagonist or a blocker for mouse TLR2 ? Thank you for your enquiry. All the information that we have regarding this antibody is located on the online datasheet. To our knowledge, ab11864 has only been tested for application in Immunoprecipitation, Immunofluorescence, and Flow Cytometry / FACS and has been found to be unsuitable for Western blotting. At this time, we don't have any information about whether it can be used in blocking experiments. If you have any more questions, please contact us again.